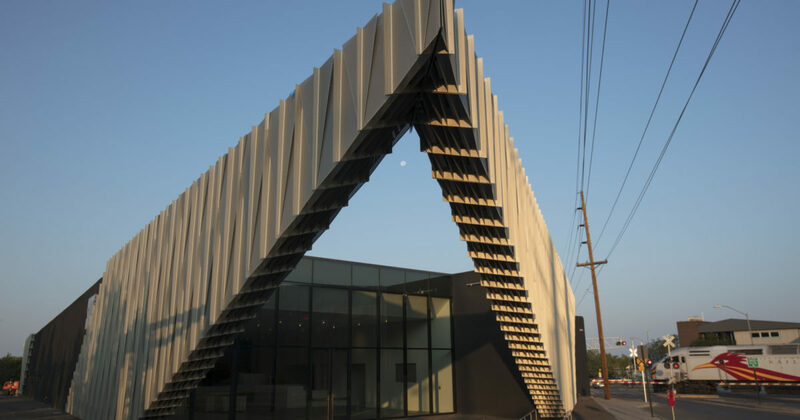 As SITE Santa Fe marks 23 years as one of the most unique and influential contemporary art spaces in the United States, we welcome you to our expanded building designed by SHoP Architects. Over the course of the last twelve months we renovated and expanded our original beer warehouse home creating a space that reinvents our institution and brings a distinctive building to Santa Fe’s landscape. Our new building will allow us to increase our capacity to engage the city of Santa Fe and beyond with dramatic new spaces for art, programming, and gathering. SHoP Architects created a design for SITE that provides elegant new spaces within the building and an iconic new form on the exterior of the building. Their design is distinguished by a perforated metal cladding that unifies SITE’s original building with new additions in both the front and the back. In the Spring of 2015, SHoP’s design plans for SITE were approved by the Santa Fe Railyard Community Corporation Design Review Committee. In early summer 2016, our Campaign Fundraising goal reached 75%, and our building permit was issued. Just a few months later, our project broke ground with Board, Members, neighbors, and Railyard and City officials on hand to celebrate. In the fall of 2017, we completed construction and opened our re-opened our doors to the public. New interior space: 10,000 sq. ft.
New exterior space: 5,000 sq. ft.
Total building space: 34,000 sq. ft.